The Great American Seafood Cook-Off 2008 has showcased five delicious recipes from famous chefs from different States. The five recipes presented were Colorado Striped Bass Panzanella by Chef Paul Anders (Colorado), Pan Roasted Glazed Rockfish with Peas and Carrots by Chef Tafari Campbell (Maryland), Mississippi Redfish Courtboullion with Seafood Dirty Rice by Chef John Currence (Mississippi), Texas Gulf Shrimp by Chef Mark Holley (Texas) and Louisiana Shrimp and Andouille Cassoulet (Louisiana). 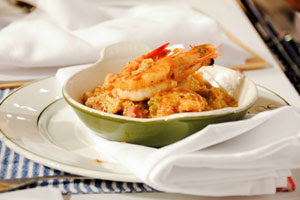 Amongst the five delicious recipes, I voted for Louisiana Shrimp and Andouille Cassoulet. I liked the recipe because the ingredients are easy to find and even a non-professional chef like me can easily cook it by following the instructions. The good thing about this cook off events is that they recognize local seafood products of each state. Thus making the inhabitants of the area patronize their own seafood products. Aside from this, people can learn to really give time and cook something special for their family using products and ingredients that are available to them. Using fresh products is always the best ingredient in making good and delicious food. Such cook off events can also help recognize local chefs of each state; they will not only be recognized in their own place but of the whole United States. This will also give our local chefs a big moral boost into creating more special and sumptuous meals. By the way, I suggest you go and visit www.GreatAmericanSeafoodCookOff.com today. They have an ongoing promotion. Just vote for your favorite recipe and you will have the chance to win a “Trip to New Orleans” prize package. This includes two roundtrip tickets, hotel accommodations, great dining and more. So visit and vote today! hey mommy ruby… got an award for you here..